I'm here to tell you that there's nothing I love more than having the sensation of an orchestra playing in my sitting roomor, more to the point, of being transported to the venue in which the orchestra was recorded. On the last night of the few months I had Sonus Faber's recently revised Aida loudspeakers in my own sitting roommy basement listening roomI decided to check out the boxed set of Beethoven symphonies from the Berlin Philharmonic, issued on vinyl (10 LPs, Berliner Philharmonic BPHR160092). Though released in 2017, it had arrived here only recently, and I first wanted to hear Sir Simon Rattle's interpretation of Symphony 9. The vinyl releases (and associated high-resolution downloads) were recorded at 24-bit/192kHz with a pair of mid-side (M/S) microphones. As anyone who's heard the justly famous Satchmo Plays King Oliver (LP, Audio Fidelity AFSD 5930/Analogue Productions AAPJ5930), the M/S technique can produce intensely solid, three-dimensional imaging. The late Louis Armstrong sounds as close to being "alive" between my speakers as a recording can manage. The CD and BD editions of the Beethoven box were made from multi-miked recordings. At around 2am, as the reverberation of the Ninth's last notes faded away, I found myself exhausted, overwhelmed, and somewhat disoriented, all in the most pleasurable way, by the most convincing illusion I've ever experiencedby a considerable marginof having been transported from my modestly sized listening room to a concert hall (the Berlin Philharmonie). I haven't heard the multi-miked version. I have sets of the Beethoven symphonies by Bernstein, Karajan, Klemperer, Leibowitz, Walter, and Paavo Järviall of them sound good, some better than others. This new one from Rattle and Berlin might be the most spatially together and believable of all, and it's digital. Of course, I think the reason for this is the minimal M/S miking. The digits are just how it's originally stored, and the software keeps getting better. Generally speaking, the performances sound very "proper," well organized, and understatedly British. When I listen to Karajan or even Bernstein, I see dark evergreen forests. Rattle's Ninth had me seeing English countryside, rolling fields, and meadows. I'm not kidding! The next day, when Bart LoPiccolo, regional director of sales for Sonus Faber's parent company, the McIntosh Group, and a coworker came to pack up the Aidas, they first asked to hear them. I obliged with the Ninth's final movement. I also played for them "Whole Lotta Love," from Bob Ludwig's now-famous 1969 cut of Led Zeppelin's II. Later, when John Atkinson arrived to do some measurements, I played him the Beethoven. Then the Aidas were gone. The revised Aida costs $130,000/pair, and pictures in a magazine or online don't well communicate its size or dramatic styling. It's big5' 8" tall by 18.9" wide by 30.7" deepand graceful looking, and in a modest-sized listening room a pair of them seem even larger, almost comically so for the space. I shot a video of their installation here and posted it to YouTubewhere you can read the comments of skeptics who can't imagine that these speakers and my room could possibly work together. Externally, the 364-lb, "3 and 2/3 way," multi-driver Aida is indistinguishable from the original, which was launched in 2011. 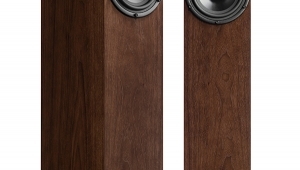 It's available in Sonus Faber's new Wenge finish, in addition to the familiar Red. 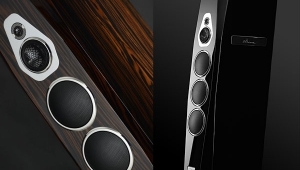 Both feature inlays of maple and glossy, hand-polished surfaces, and Sonus Faber's snazzy combination of black leather, gleaming metalwork, and their unique, top-to-bottom, stretchy stringy, licorice harp thing. Inside, the Aida is entirely new, including the drivers, which have neodymium magnets and were designed by Sonus Faber, then built to their specifications. Some speaker makerseg, Wilson Audio Specialties, YG Acoustics, Magicoseek to heroically eliminate cabinet colorations and resonances altogether. 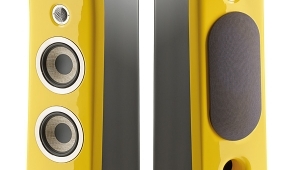 Sonus Faber has long advocated "tuning" their speaker cabinets by combining materials of different resonances. However, it's not accurate to say that SF views its loudspeakers as "musical instruments," though of course they're "tuned." 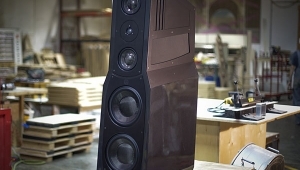 A photo on Sonus Faber's website shows an Aida II under construction. The inner cabinet is a curved structure of leather-clad wood in which at least five chambers are created by cross-braces, a few of them wedge-shaped to direct rear-radiated energy to the Aida's various ports. To those who use metal and composites to eliminate resonances, the Aida's innards probably look old-schoolbut the proof is in the listening and, to a lesser degree, the measuring. Mounted on the Aida's gently sloped baffle is the Voice of Sonus Faber: a tweeter-and-midrange module comprising a 1.1" (28mm) XTR-4 silk-dome Damped Apex Dome (DAD) Arrow-Point tweeter and a 7.1" (180mm) XTR-04 midrange unit with a cellulose-pulp cone. A vertical bracket holds a small damping pad against the tweeter dome's apex, to optimize top-octave dispersion. 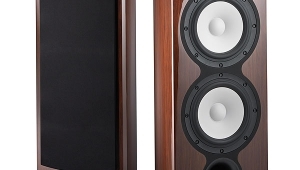 Both drivers are decoupled from the main baffle, the tweeter's rear wave loading into a natural wood "acoustic labyrinth." Below this module are two 8.7" (220mm) W22XTR-12 woofers with neodymium magnets. Not visible is a downfiring 12.6" (320mm) SW32XTR-08 long-throw subwoofer featuring a Nano Carbon sandwich cone and a 4" voice-coil. Also not visible from the front is the Sound Field Shaper, a rear-firing, ported, midrange-tweeter-midrange array, comprising a 1.1" (29mm) silk-dome XTR2 DAD tweeter and two M8XTR 3.15" (80mm) midrange units. The Aidas are handed: the axes of the Sound Field Shaper drivers are offset from those of the front-firing drivers, so by swapping the left and right speakers, the user can opt to have the rear-firing arrays angled in toward the center of the stage or out toward the side walls. 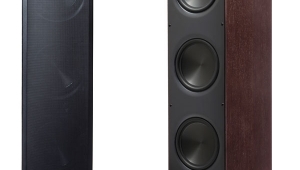 Sonus Faber suggests angling the Sound Field Shapers in when the Aidas are placed close to sidewalls, and out when the speakers are at least 2m from the sidewalls. The Aida's massive cabinet is affixed to an arched pedestal, made of aluminum. This is designed to provide clearance for the output of the downfiring subwoofer, and the zero Vibration Transmission system decouples the cabinet from the floor with springs and elastomers, their compliances carefully calculated based on the speaker's weight. 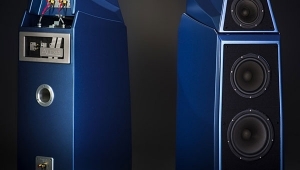 Also used here, as in some previous big floorstanders from Sonus Faber, are their Tuned Mass Dampers (TMD)a series of weights suspended inside the cabinet, and designed to vibrate in antiphase to "erase" cabinet vibrations. SF says that this system helps produce clearer bass and increased "cabinet silence." Sonus Faber's patented Stealth Ultraflex para-aperiodic venting system is claimed to reduce total harmonic distortion (THD) while improving bass extension and eliminating vibrations created by the flow of air through the reflex port. The design is also said to have made possible a smaller enclosure. Also used here is SF's Anima Legata system, which features a cabinet-stiffening, "vibration collecting metal rod, here running between the speaker's upper and lower-middle inner chambers. If something TRULY comes along as being groundbreaking and advancing the technology, sure, slap a high price tag on it. An example, Bang & Olufsen Beolab 90? At a lower, reasonable price point, maybe the Kii..?? You Can't Read With Comprehension Can You? The speaker didn't "fart". The word was used by a CONDUCTOR to describe a particular confluence of instruments in Beethoven's SCORE. What's wrong with high end audio "these days" are people who can't read with comprehension, or are so busy grinding axes, they read what they wish to read and not what's in the words written. YOU are the one not being objective. But you are objectionable. The "fart" thing was of course a joke from my side.. I assumed most people understood that. As for the rest of my comments, I stand behind them 100%. But, if the speaker did fart, it would surely produce a warm sound. 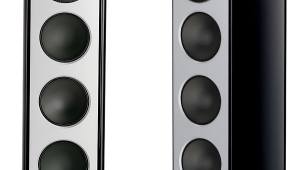 It's no surprise that a $130K speaker sounds really good. So what? Yes, it's beautiful and, again, so what? The real test is whether it's worth the asking price. Is it? Not from what I can ascertain from this review. The future is Kii (as previously posted), Legacy, may be B&O (if their stuff isn't too crazy or crazy expensive) and KEF if they make something bigger than the LS50 Wireless that has all that goodness. And any forward thinking company like them. At this point in time, it's absurd that people are hanging on to moderately updated tech from 50 to 100 years ago. The future of the speaker industry is DSP. 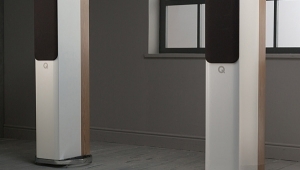 Bruno Putzeys stated that the reason he started Kii Audio was that he felt that amp tech had hit a point of very diminishing returns, but that speakers had not seen the revolution that had been made with amps. DEQX, Dirac and Audessy have been sounding the call for DSP for a while. And when you have a fully DSP'd speaker that has an amp for every driver, you can achieve something close to perfection. The industry, for the most part, though, is holding on to the past. And I mean all of the industry (this site, too). Case in point: you are playing the vinyl release of a high resolution digital recording to review these speakers. That's like taking a Blu-ray disc, recording it to VHS and, then, viewing it on a new hi-def TV. Just like these huge, incredibly heavy speakers. KR reviewed the Kii, they're rather pricy but wonderful. If the large loudspeaker (sans DSP) is properly designed and built, its superiority over the small DSP-served speaker should be obvious in a short listening session. If not, you just saved a lot of money, as people often do when they buy those Bose Wave radio/CD players. It's hard to make a smallish speaker compare to a much larger speaker. No EQ can get you there, but to fool yourself that you can, you'd probably make your comparison to a larger speaker that's not the best for its size. In just one example, getting equivalent power output requires small drivers that will distort more, or cost many times as much. But there are good shortcuts and bargains available for those who accept the compromises. A lot of the speakers that are reviewed state "for the money" or something to that effect, which would obviously suggest a compromise in some area. With today's technology only so much can be done regarding speaker size, power handling, efficiency, etc. If someone wants to spend the bucks, all the power to them. Is this a crime? Taking into consideration the law of diminishing returns, there are likely thousands of products categories, including speakers, where a multitude of people fall into and have biases, likes, dislikes, for any product. For some, is the cost of a product worth the value one gets out of it? If someone prefers the sound, why not? I will not tell someone that one of their components sounds like crap to me, or should sound like something I like including something that "measures well". Mr. Dalethorn makes a good point. I will not begrudge anyone who likes "the sound" as I am POSITIVE there are many who would not like the sound(s) I prefer, and that is ok by me. I chase the sound that makes me feel good, whatever that product may be. Bose has no place in an audiophile system. studio speaker companies (on the high end) have moved almost entirely to active and DSP controlled monitoring, but the sound and use cases are very different and probably not what consumers actually want. Audiophiles like to mix and match components to find the synergy that gives them the sound they want - whether it's actually accurate or not is a different discussion. AD is hardly the only person who likes the old Altec sound like the 604 coax or Model 19 2-way (modified) that Bob Ludwig used to master a LOT of 80's hit records. I really like active speakers myself (need to refurb my very low serial number Genelec 1031's) because they're dynamically far less compressed than most passive speakers and the amp/speaker match is superior... but most audiophiles are tweakers who like to try new combos and passive separates makes that easier. if any of the "technically accomplished" or alternally cash-conscious, progress-fascinated, moral indignation-filled comments ever comes from people who can actually afford to hear and buy these beautiful things. You don't need to afford a Bugatti Charon to know that it's absurd and the end of the road for gas-powered hypercars. This is the same for non-DSP loudspeakers the likes of this one, anything from Wilson Audio and the like. 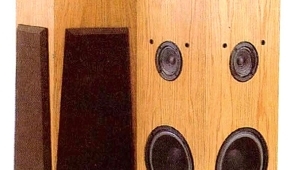 There are still gigantic problems with passive loudspeakers that can never be fixed by a better cabinet or analog crossover. It's not possible. I have spent time with Meridian's DSP8000's (forgot to mention them). Even without room correction, they are stunning and half the price of the Aidas. Even if I had the cash to spend on Aidas, I wouldn't. They aren't worth it. I'm going to be replacing the LS50's and Rythmik servo subs in my main system with custom built mains using a Raven Line Source ribbon and eight BG Neo10's per side. The subs are being replaced by a stacked tower of custom, cardioid subs per side that will employ ten 8" Rythmik servo sub drivers and associated amps. I'm going to use a Xilica XD-4080 FIR speaker processor as a crossover and the mains will be driven by a pair of Benchmark AHB2 amps. DSP will be Dirac Live. At 20% of the price of these Sonus Faber behemoths before you even buy the amp(s), this design will eviscerate the Aidas in every possible metric. And, yes, they will just sound better as well. Again, I don't doubt that these are great sounding speakers, but they are not state of the art and never will be as long as they are passive. Are you seriously comparing a DIY project with commerical systems?? I suppose most ppl who tinker around in the DIY world are more than a lightyear & a lifetime away from being able to purchase a hifi system of several 100k. Those who can, I imagine, will not be able to hold a soldering iron, nor want to, in their scarce free time. You can tinker as much as you want, no need for portability, no margin, no marketing budget, etc. Several hundred thousand dollar systems are luxury products and performance isn't the priority in that market. Since hardly anybody has ever gotten really familiar with those systems nobody knows how they perform but there's no reason to think they're particularly exceptional. The best engineers aren't designing that stuff. just different. you're DIY'ing a very different kind of speaker than the Aida, which will certainly sound different (and not look as good) - but whether that = better depends on taste. You're going to have some real problems integrating the ribbon/planars/cones into a coherent whole... and looking at the specs, 4 of the planar mids would probably gel better than 8 - the efficiency numbers match up better so less processing required. You really think that's what this is about? Maybe I'm not as "technically accomplished" as much as you think. But I've been in this hobby (it is a hobby, isn't it? ), to have learned that more $$$ does not equal better sound quality.. I believe, and hear, difference, in power chords. "In 1959, in their musical revue At the Drop of a Hat, the British musical-comedy team of Flanders and Swann sang their "Song of Reproduction." "
Parlophone PMC 1033. Looking at it right now, next to my 10" copy of "Songs by Tom Lehrer" on Lehrer Records TLP-1. Years ago JA did an in-use measurement of a Wilson and another speaker showing a large audible frequency response notch below middle C. He identified it properly for what it was, an example of the Allison effect. It was wonderful to be able to use it to discuss what happens when you misdesign a speaker with respect to the three near boundaries and get an unnatural thinning suckout in the lower midrange. And now this design is even better in that regard, meaning even more starkly misdesigned for accurate playback in a room. What a great example and what a great terrible curve figure 5 is! Textbook, perfectly textbook of what not to do --- unless you don't care about natural sound and accuracy of playback. Roy Allison is wincing and chortling in his grave. That's not due to speaker design, that's MF's room - literally every speaker has a response depression in the low mid in his room (check his other speaker reviews). He even explicitly mentions it in the review itself (which you probably didn't even read, for if you had you would not have made this comment). It's not a room effect in the way that resonances are; it has nothing to do with room resonances. No room inherently has the consistent lower-midrange dip. Any speaker designed such that the driver(s) reproducing the two 90-360Hz octaves approach equidistance from the three near boundaries, as with a speaker on a stand or equivalent, meaning the said driver(s) are at standlike height, will show suckout problems somewhere within those octaves. In any room. To first order it is room-invariant and, crudely, also listening-position-invariant. With pink noise and a smartphone RTA set to averaging you can check it for yourself. 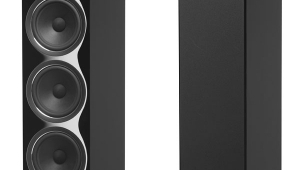 Conversely, a speaker designed to enforce *staggered* ( = non-equidistant) distances to the three near boundaries, 2'/3'/4' or 2'/3'/5' are nice, or simply with the woofer close to the floor, will have no, or much less of a, constant power notch below middle C, even if the room is, you know, an 11' cube. That room will have terrible other problems, but they will vary as you move about, whereas this one not so much. Allison effect is unrelated to room resonances. Having the crossover seam there sure appears to aggravate the problems. That's it not stellar, at all. The lowest orchestral note (ignoring giant pipe organs) is 27.5 hz as far as I know. It would be good to know what the response is at that frequency, but more importantly, how it sounds compared to other speakers in its price/size range, at that frequency. I heard the speakers in combination with the entire Nagra HD-line and I was very impressed: coherent and full of soul from top to bottom. 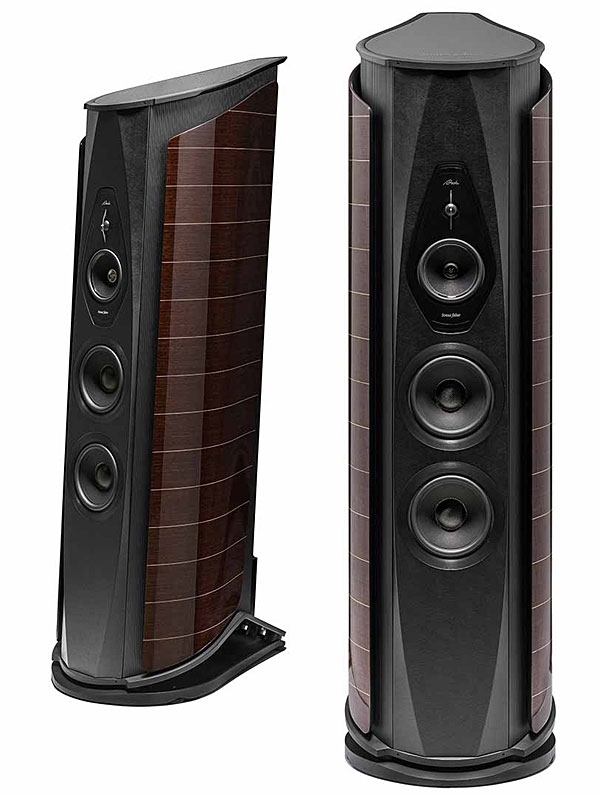 I never was a Sonus Faber fan but these really wowed me. I spent several hours over two days listening to the Aidas at the 2018 AXPONA show. 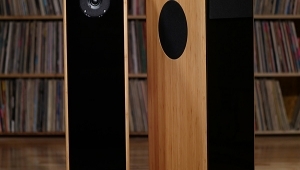 I heard a lot of great sounding speakers at AXPONA, even one costing over twice the price of the Aidas (Von Schweikert Ultra 11 - $300,000), but I kept going back to the Aidas. The Aidas presented a life-size sound stage with the most dynamic, most life-like music presentation I have ever heard from a loudspeaker. As a musician, I appreciate realism and accuracy in music reproduction. I particularly appreciated Michael's video on the Aida installation in his listening room. It's nice to know they will work in modestly sized rooms...like mine.